After less than a year on the market, the iPad has already been made obsolete by its own creator with today’s introduction of the iPad 2 — or has it? Just how big of a jump is it from the first round to the second? 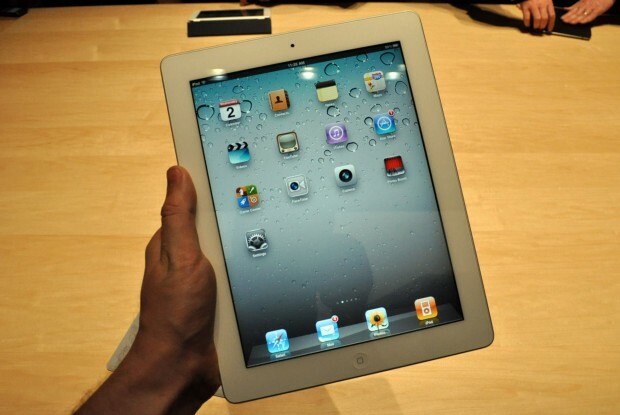 How does the new iPad feel in the hand? Is Photobooth going to be as much fun for stoned college kids on the iPad as it is on OS X? We spent a bit of time with the iPad 2 today following Apple’s announcement — join as after the jump as we attempt to answer all these questions and more! There’s something about holding a new Apple device that feels unreal — and that’s not whatever Fanboy-side I have rearing its head. Apple devices are ubiquitous; their silhouette and feel and weight tends to become engrained in the brain. When Apple goes and shaves a few millimeters off, holding the new device is just a bit of a system shock. That’s certainly the case here. Apple shaved 33% off of the thickness, and it really, really shows. The bezel around the screen has changed; the edges taper off into flushness, giving it a smooth lip that feels great to hold. This adds to the slim feel considerably. It really, really feels like a big iPod Touch now. Yes, Photobooth is just as much of a blast on the iPad as it is on OS X. It’s by no means the most essential app — but seeing it churn out 9 simultaneous live video feeds complete with some rather complex filters was pretty impressive. Most of the filters could be manipulated in one way or another via touch; the Swirl filter’s swirl could be moved, the Tunnel filter’s touch could be pinch-zoomed. It’s hard to gauge the speed improvements of the new A5 processor over the old A4 right now, mostly because the original iPad was pretty good about not lagging. The dual-core difference will undoubtedly be played upon heavily in apps released in the future, but there’s not going to be any blatantly apparent difference in the UI or most of the stock applications. With that said, it definitely feels faster. The new magnetic Smart Cover is perhaps the coolest part, if only because it’s so unique (not to mention, totally unexpected.) Thanks to the crazy quick-snap system (it feels like plugging in a MagSafe adapter), it seems just about impossible to pop on incorrectly. All-in-all, putting it on and taking it off takes milliseconds. Do you need an iPad 2? You probably know the answer to this. If you have an iPad 1, I’d recommend in most cases to stick with it until iPad 3 rolls around. The cameras are great and all, but it’s not nearly as convenient to shoot a quick picture or video with a big ol’ honkin’ tablet as it is with a pocketable device. Thus, the main use is video chat — and outside of regular travels with family at home and others who’ve already jumped into the future by making video chat a part of their lives, it tends to become a cute novelty after a use or two. If you don’t have an iPad 2 (and can’t wait a few months to see if the super-quick-iPad-3-followup rumors pan out), or if the apps that come along and take advantage of the new A5 processor really get your gears churnin’, go ahead and dive in.